Welcome to another installment of the TRASH BIN, where we watch the worst movies Hollywood has to offer, according to the critics, and give you our thoughts, good or bad. This week's pick is the 1986 wacky sci-fi rom-com...HOWARD THE DUCK. Yes, I know, I'm reviewing another movie from the 1980s. You may be sensing a pattern, but hey, all writers have their favorite genres, and 80's films happen to be mine. Howard the Duck was a film panned by critics when it first came out because it didnt really offer anything positive for adults or kids. But, that didnt stop me from loving it. I thought it was cool to see a duck in human form that wasn't animated. I'll admit the plot was a little far-fetched to say the least. 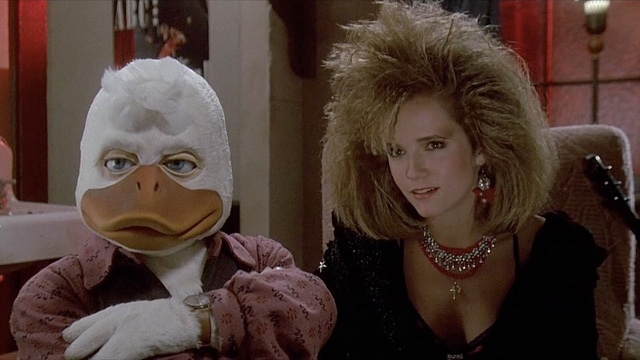 It's not everyday a duck from outerspace falls in love with a rockstar (Lea Thompson). I thought it was a great movie, despite it having a 13% critic score on Rotten Tomatoes. Most critics thought it had an uneven tone and subpar performances, which I disagree with. Lea Thompson's performance was the best thing about this movie. She was really cute and had a funky style, which I enjoyed. I also loved her in Some Kind of Wonderful. Howard came from a place called Duckworld, a planet similar to Earth. A laser beam used in an experiment accidentally brought him to earth. I loved when he freaked out after seeing humans and the reactions from the people of Earth where just as funny. He ends up rescuing a singer named Beverly, played by Lea Thompson, from some thugs. Throughout the film she tries to help Howard in various ways. He even ends up playing in her band. This is one of those films I wish had gotten a sequel. Something I never knew until recently about Howard the Duck was that it was based off a comic book character created by writer Steven Gerber and artist Val Mayerik. He appeared in comics published by Marvel. Screenwriter Gloria Katz, who adapted the comic book into film, went on to defend the film against the critics, exclaiming, "It's a film about a duck from outer space!" I loved it's orginality, even though IMDb users only gave it a 4.6 out of 10. It seemed as though critics were trying to read more into the film than what was actually there. Sometimes the critics get it wrong, and in my opinion, this is one of those times.